While reviewing a technical document, I found a most humorous typo: suedo-code. Unless the code is actually made of suede, I’m going to assume the author meant Pseudocode. Susan P: Maybe it’s sudo-code: code with someone else’s privileges. JD: Or Sudoku-code: writing code in a 9×9 grid. Susan P: Swedo-code: BORK GET BORK. JD: How about Swayze Code : ghost – writing dirty code in a roadhouse style. Susan P: Do-Si-Do Code: Code called out then performed through dance. JD: Sous-Chef Code: Writing code while your boss watches over your shoulder. The. Whole. Time. Sarah G: Sudo-code: code you need to wrestle with. Shahna S: Suet-code: the woodpeckers love it. JD: Suez-code: this bit of legacy code allows a free flow of information between two databanks. Conflicts arise when rival coding teams try to lay ownership claim to the Suez-code and historical hilarity ensues. Susan P: Churro-code: It only seems crunchy, but once you’re past the somewhat spicy bits there’s nothing but sticky goo beneath. 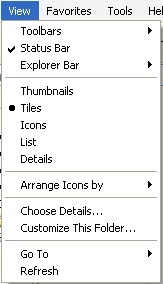 Mind you, this is a design feature. Sari S: A Boy Named Sue-code: only makes sense when played on a guitar. Douglas T: Suedocode? No, Coderouy! Just in case any of you go crazy and decide to be Technical Writers, let me impart this nugget of wisdom: when writing instructions, be aware that users PRESS keys on a keyboard and they CLICK buttons on the interface. These terms are NOT interchangeable. Also, the SCREEN is the piece of hardware you use to see the application, but the application itself appears in a WINDOW. These terms are also NOT interchangeable. Does no one remember what happens when you cross the streams? Bad things happen. BAD. BAD. THINGS. 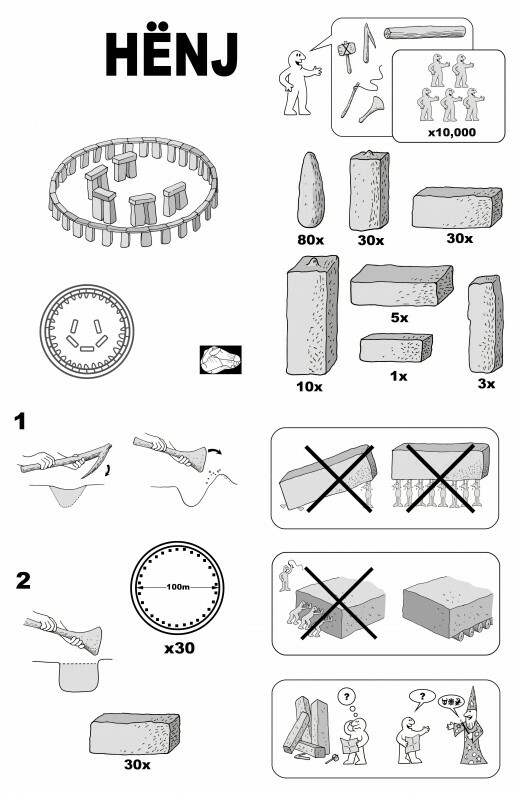 Is there a way to reduce text and replace it by illustration like ikea user guide? I think it would be much efficient. I don’t think using Ikea as the model is a good idea. 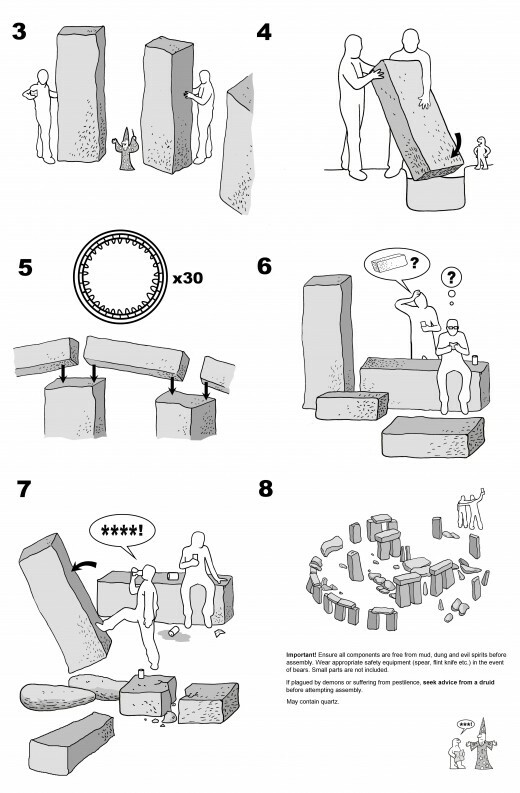 Ikea has a reputation for having completely illegible and confusing picture-based instructions. They say that a picture is worth 1000 words, and in certain cases, that’s very true. For example, this is true for art when each person can have their own interpretation of a piece of art and come up with their own 1000 words to describe it and have it be perfectly valid (if not, it’s at least open for debate). But when it comes to technical instructions, each reader must come up with the same, precise 1000 words to successfully complete a task. This is the beauty of words because they are precise and specific, unlike a picture which is always open to the randomness of interpretation. I’m currently relearning the joys of RoboHelp after a few years and a few versions of unfamiliarity and I hit a snag on trying to convert documents into topics. 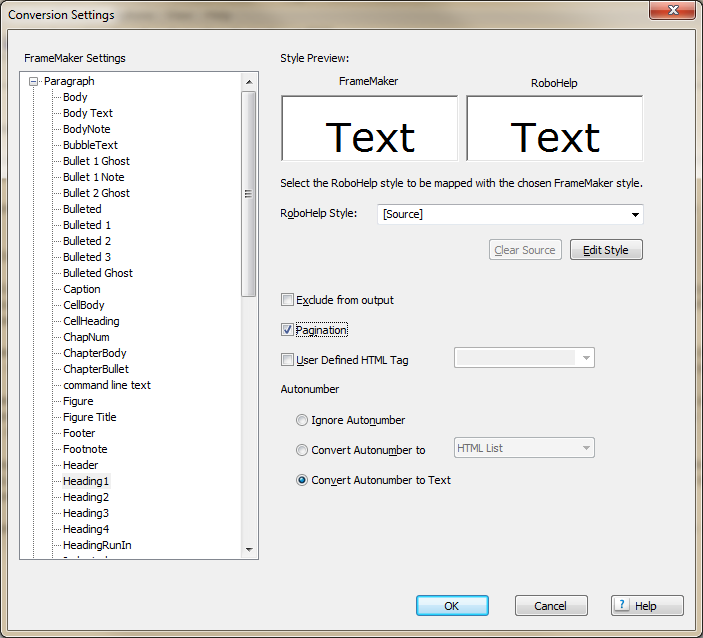 I’m using Framemaker 10 and RoboHelp 9 (as part of the Adobe Technical Communication Suite 3.5). I had written the Online Help topics in Frame 10 using Headings 1 to 4 to provide some structure. Once the content got through the First Draft of approval feedback, I wanted to convert that Frame document to Robohelp. What I wanted the conversion to do is to create individual topic files based on the heading level instead of each document being one big topic file with multiple heading sections. But when I tried to convert the Frame document to Robohelp, it created one big topic per Frame file. After padding through the Adobe support forums a bit, I found the answer. RoboHelp 9: When importing a Frame document into RoboHelp (File > Import > FrameMaker document), you click Next on the first dialog box, then click Edit. 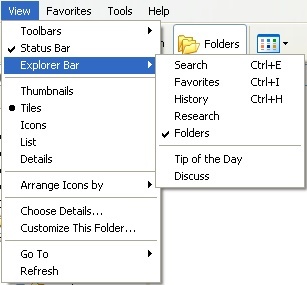 RoboHelp 11: Select the Project tab, look to the Link panel, and click Settings. In the Import tab, click Edit conversion settings (for Frame or Word). Open the Paragraph tree, select each applicable Heading level style, and click the Pagination checkbox. This will create a topic every time it encounters the style you specify (in my case, Headings 1 to 4). If you have a cover page per chapter, you may want to select the Paragraph styles on that cover page and select Exclude from output. I often find that the cover pages in a book have no relevancy in Online Help. It’s not credited in the video, but I’m assuming this is performed by the Pete Zolli Trio.